Eight segments pulsed magnetron. Typical specs: 12KW peak at 9.5cm, with 8.5KV. Starting form the early prototype assembled by Randall and Boot at Birmingham University, E.C.S. 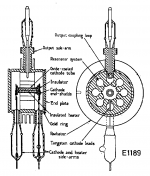 Megaw of GEC designed the E1189, which was the first pulsed multicavity magnetron to be produced. In the prototypes the anode had six cavities, machined using the chamber of a Colt revolver as drilling template. The early design was modified to use an oxide coated cathode and, starting from the sample No. 12, the anode had 8 cavities. The same sample No. 12 was brought in August 1940 to North America by the Tizard mission and its design details were disclosed to Western Electric and to Raytheon in U.S. and to R.E.L. in Canada, originating a wide variety of types. E1189 was used in the Naval radar Type 271, operational since July 1941. Later the tube was standardized as NT98. The following extract from Metres to Microwaves - Callick, gives some of the background to the developments that lead to a practical device capable of mass production in England and the USA.